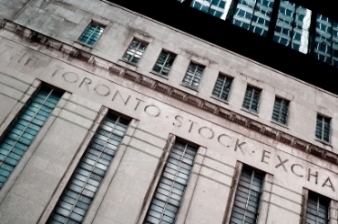 The main index of the Toronto Stock Exchange managed to end Thursday’s session with a small gain despite oil prices declining on rising US stockpiles. Gold mining stocks were one of the better performers of the day. Wall Street closed lower as official data showed a rise of 2.1 million barrels in the week, lower than analysts expected but higher than earlier industry figures. Asian and European indexes closed mostly higher although Shanghai was lower on weak inflation data. The Canadian economy will grow by 1.4 per cent in 2016, down from a previous forecast of 2.0 per cent. That’s according to the OECD which has also cut global growth expectations to 3.0 per cent (from 3.3 per cent). The Canadian downgrade was one of the largest with the US down 0.5 percentage points and the Eurozone down 0.4 percentage points; the outlook for 2017 is 2.2 per cent and is down 0.1 percentage points. Statistics Canada reports that wholesale sales rose 2.0 per cent to $57.2 billion in December with gains in four of seven subsectors, accounting for 66 per cent of wholesale sales. The motor vehicle and parts subsector led the gains; excluding it wholesale sales edged up 0.1 per cent. In volume terms, wholesale sales increased 1.8 per cent in December. Employment Insurance beneficiaries increased by 2.2 per cent in Alberta and 1.6 per cent in Saskatchewan in December, StatsCan said. There were fewer beneficiaries in Nova Scotia, Quebec and Ontario. Overall, the national level of beneficiaries was little changed from November at 539,800, down 0.5 per cent. The Alberta total of 62,500 was double that of 12 months ago.